A thoughtfully constructed syllabus can be transformative for your students’ learning, communicating the path they can take to succeed. This book demonstrates how, rather than being a mundane document to convey policies, you can construct your syllabus to be a motivating resource that conveys a clear sense of your course’s learning goals, how students can achieve those goals, and makes evident your teaching philosophy and why you have adopted the teaching strategies you will use, such as discussion or group activities. Developing or revising a syllabus also presents you with a perfect opportunity to review the learning possibilities for the semester. Well-designed, it can help you stay focused on achieving the learning outcomes, as well as determine if the class is on track and whether adjustments to the schedule are needed. The authors show how, by adopting a welcoming tone and clearly stating learning outcomes, your syllabus can engage students by explaining the relevance of your course to their studies, create an all-important positive first impression of you as an instructor, and guide students through the resources you will be using, the assignments ahead, as well as clear guidance on how they will be assessed. Referred to frequently as the course progresses, an effective syllabus will keep students engaged and on task. Christine Harrington and Melissa Thomas lead you through all the elements of a syllabus to help you identify how to present key messages and information about your course, think through the impressions you want to create, and, equally importantly, suggest how you can use layout and elements such as images and charts to make your syllabus visually appealing and easy to navigate. "Harrington and Thomas insightfully apply principles from the motivation research literature to demonstrate how course syllabi can be powerful tools for stimulating students' enthusiasm and motivation to actively engage in course activities. 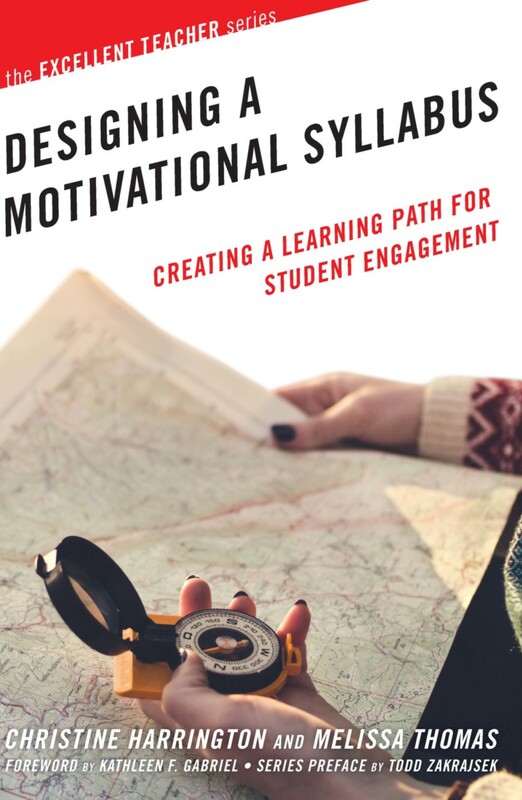 While the book is an invaluable resource for designing a syllabus that maps out a path for student success, it also provides information on course design, assessment, and teaching approaches. It is a must-read for all faculty who want to construct a syllabus that is sure to increase student engagement and learning!" "Designing a syllabus is a task that faculty often give little thought to. However, in this engaging and thoughtful book, the authors have crafted a guide that is both helpful and a teaching tool. The authors weave student learning throughout the book and have developed a resource that will help both new and seasoned faculty. And, because the book is so well written, it is accessible to all, regardless of discipline." "In Designing a Motivational Syllabus, Harrington and Thomas provide compelling rationale and evidence for why an instructor would want to reimagine their syllabus, while offering practical advice for how to create a document that accurately articulates their vision, motivates students, and fosters learning. Subtle in their approach, they quite cleverly shift the focus from syllabus creation to course design, and in doing so, signal the importance and seriousness of such work. Instructors, whether wishing to make small changes to their syllabi or to totally rethink the why and hows of their courses, will find this book an invaluable resource." "Designing a Motivational Syllabus provides practical guidance, but it is much more than a how-to: it presents new ways of thinking about the role of the syllabus. Drawing from current research on best practices, Harrington and Thomas provide thorough context and make a strong case for an effective course syllabus as a foundational tool to shape student learning. This book will undoubtedly be valuable to new and experienced teachers as well as faculty development professionals." syllabus, particularly as seen through the eyes of students. The authors advise thinking of the syllabus as a motivational tool rather than a punishing list of policies or a repository for contractual language; moreover, they suggest embedding more visual tools and images as well as more explicit rationales for assignments, even down to the individual class level. All of what they propose seems simple and reasonable, even for busy faculty. The authors clearly aim to help faculty see the excitement of creating “a course design tool that maps out the learning path for students” (19), and their suggestions will prove most useful to those beginning teaching who want to break out of the graduate school reading list mode and to those further on in careers, particularly those who might have changed (or want to change) their teaching strategies. following issues in turn: applying course design principles with an emphasis on backward design; key components of any syllabus; policies and other boilerplate; issues of design; techniques for getting feedback and evaluating the syllabus; and ways of using the syllabus beyond its traditional roles. They helpfully include a sample syllabus as well as a syllabus checklist and sample grading rubrics. They lay out the main types of syllabi (coverage-based and activity-based) and argue for the superiority of a backward design that works from goals for students rather than from content or activities." Melissa Thomas is a Lecturer for the College of Natural Sciences at the University of Texas at Austin for the Texas Interdisciplinary Plan (TIP) Scholars program, a wraparound program that transforms the learning experience for UT students by creating a small academic community that promotes academic excellence and intellectual investment.